HELLTOWN BEER: Vilipendio Historico y Andres Augusto Mendoza Azevedo! Vilipendio Historico y Andres Augusto Mendoza Azevedo! Typically, a player of Andres Mendoza's quality will have a number of articles written about him when the end of a long career nears. Not so, Mr. Mendoza. Born April 26, 1978 and making his senior debut for Sporting Crystal in Lima, Peru at the age of eighteen, Mendoza went on to feature at Club Brugge in Belgium, Metalurh Donetsk in the Ukraine, Morelia of Mexico and the Columbus Crew, among others. He finished his career with 149 club level goals in 435 games. Scoring at a rate of better than one goal every three games, while playing for clubs of vastly different styles and cultures, speaks to an adaptable, universal and high quality skill set. So, why has Andres Mendoza's twilight career been roundly ignored? 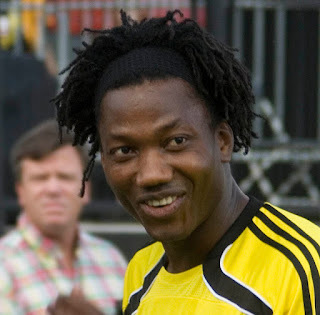 Many Columbus Crew fans will tell you that Mendoza was a selfish, lazy, out-of-touch player. They point to his "stealing" of Jeff Cunningham's penalty kick chance to tie the Major League Soccer scoring record in a home game against Real Salt Lake on June 8, 2011. Cunningham would go on to tie the record with a game winning goal during the run of play on July 6, 2011 against the Vancouver Whitecaps. Such a gifted player, one of the most skillful to ever don the Black and Gold of Columbus. What drove the Peruvian to torpedo his shot at post playing career fame? A look back at an incident during his Peruvian National Team playing days may shed some light. After a match at Ecuador, a 5-1 shellacking, Mendoza and others were found to have snuck women and booze into Peru's training compound two nights before. A one and half year ban from the national team turned into a lifetime ban as the other players saw their bans shortened. Clearly, Andres Mendoza, at twenty-nine-years old, was lacking in the common sense department, and was, perhaps, carrying baggage which Peru's National Team coaches were not willing to step-up and help carry to a better place. While there were ample reasons to vilify Mendoza during his time in Columbus, there were also ample reasons to celebrate his goal scoring and skill. No one who took advantage of his quality on the field had the ability or interest, apparently, to help the human being inside the player. As a long time youth coach with success and failure on my resume, I have had the opportunity and privilege to work with some skillful yet personally struggling youngsters. These opportunities have been some of my most memorable and rewarding. Where were the trainers willing to sacrifice for Andres Mendoza? I was/am a fan of Andres Mendoza. He was a bright light during a period in Columbus Crew history when there was little to cheer. I wish Andres all the best in his endeavors going forward and celebrate all he accomplished on the field during his long career.